Neon lights, palm trees, and groovy tunes. 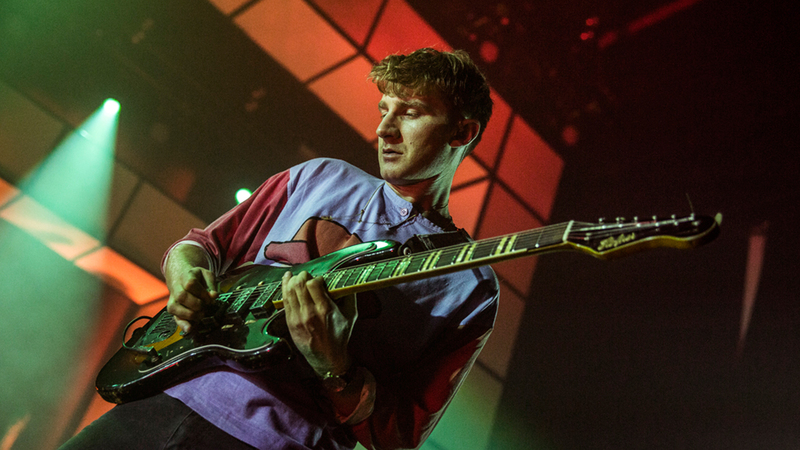 Trippy vibes and good times is what you’ll find at a Glass Animals show. Founded in Oxford, England, the band, consisting of singer Dave Bayley, guitarist Drew MacFarlane, bassist Edmund Irwin-Singer, and drummer Joe Seaward have established a unique voice since their 2012 debut. With an exotic trip-hop feel, the “Gooey” singers combine fun soundscapes, intricate melodies, and Bayley’s silky smooth vocals to create perfectly balanced, danceable music. With two full-length albums under their belt, the “Animals” musicians are now sharing their infectious tunes with fans at headlining shows and festivals all around the world. When the band brought their show to Terminal 5 in New York City, it was nothing short of incredible. The stage played host to a vast landscape of pineapples, cacti, and neon lights—an environment that prepared everyone for a fun night of tropical-inspired tunes. We were there to capture the first of two sold out nights in New York on their US fall tour to support their new release, How To Be A Human Being. Their setlist flowed from one eccentric track to the next, and was stacked to the brim with hits, including “Gooey” and “Black Mambo”. Check out our photos from the show below, and make sure to track Glass Animals so you never miss another show!